We stayed for a short break of 4 nights. It was idyllic. A quiet location, but close enough to all the amenities to enjoy happy days. out. Our granddaughter loved helping to feed the animals each morning and playing in the playground in the evening. She asked if we could stay for ever, which says it all. Great place to stay with children. A lot of to do at the farm. Hosts are very nice and helpful. Close to beautiful beaches and other attractions. Thank you Fiona and Rob for another wonderful week on your farm. My 4 and 1 year olds had the most perfect time - bottle feeding the lambs, riding on the donkeys, feeding the pigs and goats, playing with the rabbits and collecting freshly laid chicken eggs. The cottage was lovely and we roamed round the farm looking at the animals and playing on the well-equipped playground. We laid on the trampoline in the sunshine watching the buzzards above. The children loved playing in the toy house, on the ride-on tractors, in the huge castle and on the swings. We also picked lots of dandelion leaves and fed the rabbits. This holiday is ideal for those wanting a break somewhere beautiful where small children are made welcome and exposed to amazing adventures, like cuddling two-week old lambs and eating a double-yolk egg which they just collected from beneath a chicken. Farmer Rob and Farmer Fiona are friendly, kind and wonderful with children. The whole stay was a delight! Thank you so much for taking the time to leave a review and for your kind words. We love having you to stay. You and your children really enjoy the peace and quiet of just wandering around the farm, sitting cuddling a lamb, taking time to see the animals and just enjoying life away from the city and your busy job. Family time is important and sometimes just spending time in a quiet environment and making hosepipe adapters out of egg boxes, checking out the holes in Farmer Rob's hosepipes and helping cut the grass with scissors is good for the soul. Thank you again for choosing to stay with us and we hope to see you again. Lovely cottage, owners were very thoughtful and accommodating to our needs. Our child enjoyed feeding the animals and playing with Bryn and Meg the farm dogs. Would definitely come back. This was our second stay at Cwmcrwth farm. Our children absolutely loved feeding the animals, particularly the chickens and goats. One chicken laid an egg while our son was petting it - he was absolutely thrilled. The Hayloft was well-appointed if not a wee bit small for the four of us (particularly with 2 high-energy boys). Still, a very nice place to stay. The addition of a play area, including a very cool play castle and a trampoline were very welcome by our boys. Lots of little excursions close by, and we also did a day trip to the ancient, walled port of Tenby - loved that. Our hosts were ever so-friendly and a wealth of knowledge about their rare-breed animals. Would definitely return again. We were warmly welcomed by Fiona with some lovely delicious Welsh cakes that the kids ate in a matter of minutes. The cottage was perfect for us (1 adult, 2 kids) the small addition of DVD's and Toys for the kids were fantastic. The animal feeding rounds were also great, a very hands on experience for the kids. The play area up the back is also a fantastic area for the kids. I will be back again in warmer climates, as I think the kids will spend the majority of the day outside. We had a wonderful stay at Cwmcrwth farm. The kids had such a good time feeding and looking after the animals in the mornings, and playing in the playground. The tractor rides were a real highlight! It is in a beautiful part of the country which we loved exploring. Arrived to our converted hayloft with all you need for a short break. Fiona & Rob are the perfect hosts blending that level of interaction with the privacy one expects on a country break. The farm and animals are open for everyone including the children to see and interact with, the morning rounds with Farmer Rob were the key highlight of the stay and well worth getting up for each morning, not to mention the fresh egg collection! Our kids when not on the farm were playing in the fields behind the accommodation which is in earshot and allowed them some freedom. 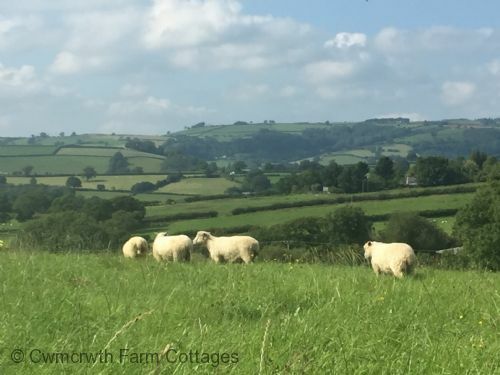 The farm is ideally located, remote enough away from roads and traffic but within easy reach of Brecon, Carmarthen and the sights of South Wales. We would certainly come back as it was the perfect family experience for young families. Thank you so much for taking the time to leave a review and we are so glad you had a good time in Wales. We really enjoyed the opportunity to find out about life in Qatar a far cry from our small farm in West Wales. Our chickens are missing their morning cwtch and attention from your son! Indeed we are lucky that visiting children are able to enjoy some freedom in the fresh air and they love meeting and playing in the play area with the other children staying on site. Thank you again for your comments and for choosing to stay with us. Beautiful cottage, very welcoming, in a fabulous location. Cottage had everything, and it all worked! There were two of us, but it sleeps four, with two well equipped bathrooms. 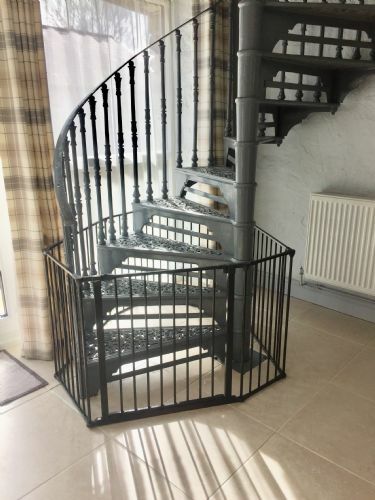 For anyone considering staying with children, I would be a little concerned about them falling down the spiral staircase as there's no guard. Other than that, 10/10 - loved it. Beautiful place inside and out. Lovely hosts too. Would definitely recommend. I was there on business and stayed for the night, however i think families with smaller children ( babies to age 11) would love it too. They have animals and a lovely play area with swings, slides, play area for little ones. Very peaceful area with LLandelio just a short drive away. We visited the farm for or sons 3rd birthday, the location was perfect and the farm is beautiful. Fiona and Rob really made us feel welcome and our son absolutely loved helping out with all the animals. We stayed in the Hayloft which was the perfect size for our little family. Everything was to hand and the breakfast pack was delicious. Would love to come back again and highly recommend staying here. Communication from start to finish was excellent. Was made very welcome from the start and then left to settle. The children loved feeding the animals each morning and the weather was on our side. Accommodation was great, plenty of room and even had Welsh cakes to welcome us. The junior farmers day was brilliant the children loved the experience of being a farmer for the day. We even got to see a goat have her kids. In our children's words this holiday was excellent and we couldn't agree more. Will definitely be going back. Rob and Fiona made us feel very welcome and the accommodation we stayed in The Hayloft was perfectly kitted out and very clean and comfortable.Ideal base if you have children as well as access to farm animals is encouraged in fact we would recommend to my son and wife to bring their young family for a holiday and would definitely return ourselves. was a return visit , the previous was six years ago and were pleased to find Seren Haf was still there. This review can be linked to the milking parlour under the same name. Thank you for staying with us and for taking the time to leave a review. We are glad you had an enjoyable stay and we loved spending time on the farm with your family. FairPlay to the teenagers getting up at 8.30 for feeding rounds! Good location if a little remote. . Host very nice, rooms very good and clean. I have been there before now I am again and I will be again. This is the third time that we have stayed at Cwmcrwth. Rob and Fiona are wonderful hosts and carrying out the daily farm rounds is definitely the highlight for our six year old daughter who is already asking me when we can come back again! The Junior Farmers day was brilliant, with a whole day full of farm chores and donkey rides which the kids love (and the adults too!) The accommodation is clean, homely and very well maintained and there is plenty to do in the surrounding area. Fiona's home made cakes were a bonus! We have just had a fantastic stay at Cwmcrwth farm with our two young boys. They both enjoyed helping out on the morning feeding rounds and the outdoor play areas are brilliant. The cottage was really well equipped for families and Fiona was very helpful with any queries we had. There is a lot to do for families in the local area and the local town of Llandeio was really pretty with lovely shops. We would definitely return. 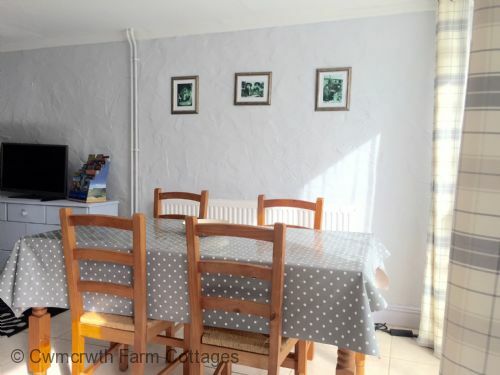 A beautiful, cosy cottage in a beautiful rural location...not too far from local and larger towns. The Hosts were very welcoming and very helpful and provided unlimited local information, both in situ in the cottage in a folder and verbally. Excellent location with lots to keep children entertained. What a brilliant set-up for enjoying the outdoors with children. No tablets, phones or televisions were required to keep a 20month only and 3.5 year old very happy. The toy selection in the cottage was very thoughtful for the time we were inside as well. My only critisim was the slight discord between the health and safety rules on the farm. Adults aren't allowed on the play equipment but children are allowed on the quad bike! This certainly hasn't put us off coming again though, the quad bike ride was one of the highlights for us! Overall, we had a superb weekend and it beats Centre parcs any day! Thank you for taking the time to leave a review and we are glad you enjoyed your stay. We are so sorry that you were disappointed that adults are not permitted to use the swings in the children's play area but the manufacturers sell the product as for children and not suitable for adults. We would be invalidating the guarantee by allowing adults and as we received a partial grant from the council to install the play area we are legally obliged to protect the asset for 5 years, we advertise the area as a children's play area and also have an under 5s area where older children are not permitted on certain toys as manufacturers advise they are only suitable for certain age groups hence we explain this on arrival and in the cottage information. We've had a lovely, fun family holiday on the farm, we are going to miss the animals, our 18 month old has really enjoyed feeding the chickens, goats and pigs and collecting the eggs. Thanks to Farmer Rob and Fiona for having us and your patience for little legs, for tractor and donkey rides, we loved these too! The cottage was well equipped, clean and comfortable with all the things you need for a family stay away (cot, high chair, toddler crockery etc) and the farm produce ( bacon, sausages and eggs) was delicious. With plenty to see and do nearby its been the perfect spot for a holiday, see you again next year! I, my husband and two grandsons aged 6 and 9 had a wonderful week in the Hayloft. It was perfect for 4 people. Both bedrooms have en suite which made life very easy and comfortable. 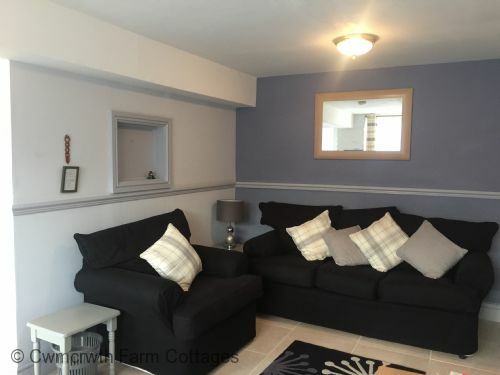 Decor clean and contemporary, good beds and bedding, fully equipped kitchen and open plan and comfortable ground floor living space - great for lively children. Iron spiral staircase between floors. TV and wi fi working. 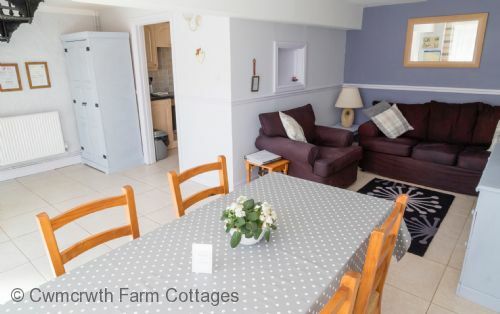 There are just three self catering accommodations arranged around what was the farmyard and is now a pleasant open space where families and children can meet without pressure. At the back of the whole complex is open grassy ground (about an acre) where there are facilities for BBQ's and a well equipped play area with space for ball games. The daily morning animal feeding round is the big attraction of the day and everyone (including teenagers) manages to get up and out by 8.30 am to join Farmer Rob for the feeding of rare breeds pigs and piglets, rare breeds goats, chickens, two donkeys and ponies and out in the fields, the highland cattle. Children are allowed to take the eggs they find back to their cottage. Farmer Rob and his wife Fiona handle the feeding and hands on experience of the families extremely patiently, carefully and safely. I made a last minute booking for me and my dog, Ted, as I just fancied getting away for the weekend and getting some fresh air. Fiona was extremely helpful, even helping with directions, as I was short of time to arrange things (and I don't have satnav). 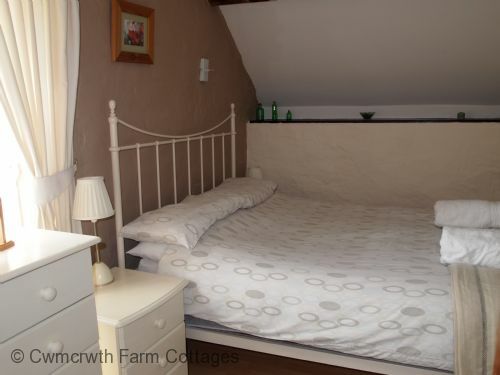 The Hayloft was clean, tidy, well equipped and the bed was very comfortable. Good shower too. 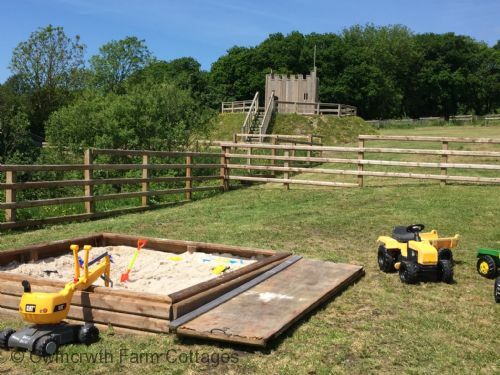 The farm is great for children with places to roam, animals to pet and various play areas. There was space for Ted to wander off lead too. There is plenty to do within a half hours drive of the farm. We went to Dinefwr, a National Trust property just a few miles back up the A40.Ted wasn't allowed in the house but there are several acres of land to explore and a castle. Later in the day we headed back along the A40 with the intention of calling into Camarthen en route to the beach, but the lines of traffic into the town were long and slow moving so we carried on to Pembry Coastal Park. The beach was fabulous and huge! And mostly dog friendly. So we had a good walk and a paddle then headed back to the Hayloft. The weather was great, which helped. Back to the cottage for tea and , in Ted's case, sleep! I was eating my tea when Fiona knocked at the door and offered me a plate of Bara brith and 3 Welsh cakes; all of which were delicious and very welcome. There is wifi in the cottage, which is particularly helpful when you are travelling alone and can't bear Saturday night TV. In fact, it's a great place to stay if you are a lone traveller as you have plenty of privacy but the owners are nearby, and very helpful, if you need them. Very enjoyable weekend with friendly hosts, the children thoroughly enjoyed the feeding of the animals each morning. would definitely recommend to all. I had imagined a bucolic and relaxing farm stay and Cwmcrwth surpassed it on every level. The farm is set in beautiful green and rolling countryside and the old farm yard is very attractive. The cottage was cosy and comfortable with everything you need for your family. The dishwasher and washing machine a brilliant addition for families. For anything else you need have a chat with the ever helpful Fiona. The BBQ area is excellent with 2 BBQS and a pizza oven. However, surpassing all this, which alone would make it an excellent family holiday, was the facilities for children. The feeding rounds follow a pattern, which appeals to the children, but are different every day. Farmer Rob is fantastic with kids, informative and flexible. My daughter is hard to bring out of her shell but every day she was desperate to get out to feeding. 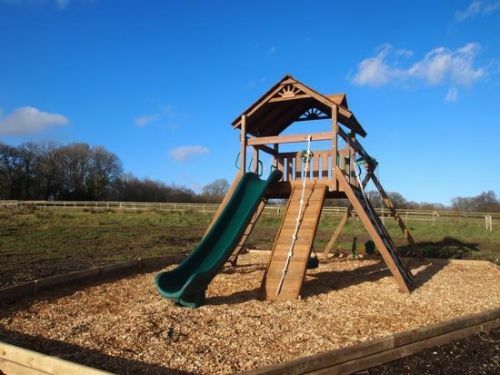 What with pond dipping and the brilliant play area, kids will not be bored at the farm. We stayed a week and do not feel we have scratched the surface of things to do in the local area. We had both sun and rain and we're never short on choices. An amazing holiday, thanks Cwmcrwth my kids loved it. As a group of 15 we rented all three cottages (Milking Parlour, Coach House, and Hayloft). Really pleasant surroundings and both the Coach House and Milking Parlour had plenty big enough communal space for us all to gather for a few drinks in the evening. Would stay again when visiting this part of Wales. 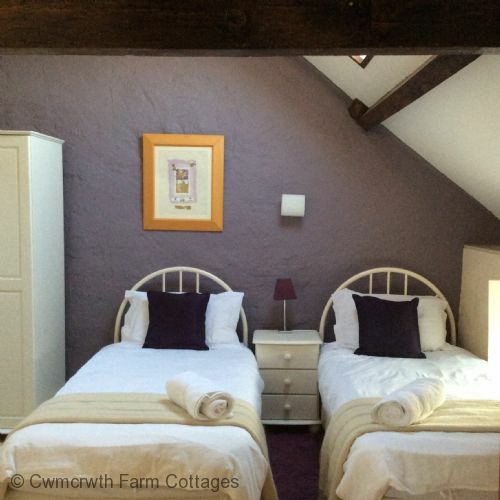 We can not praise Cwmcrwth Farm Cottages highly enough. The cottage was lovely, very clean and bright and contained everything we needed. Rob and Fiona were fantastic hosts and did everything they possibly could to make the stay as interesting and "hands on" as they could for the children. Farmer Rob has a lovely manner with the children and plenty of patience. I cannot thank Rob and Fiona enough for their kindness and understanding of our granddaughter, Rosie. The surrounding area is beautiful. 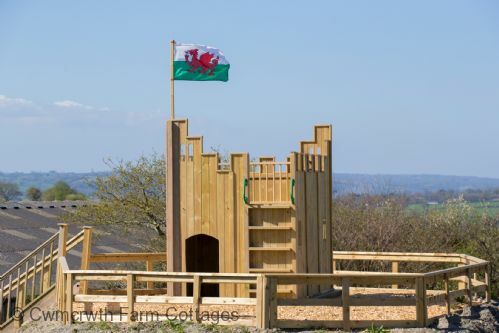 We can recommend Folly Farm and Pembrey Country Park as places to visit with children. Cwmcrwth Farm Cottages is certainly a place to be highly recommended. Thank you for providing us with fantastic accommodation to celebrate our friends hen weekend. The hayloft was perfectly presented and ideal for a large party. The open plan living room was ideal for socialising and the kitchen provided us with everything we needed to cook for a large party. 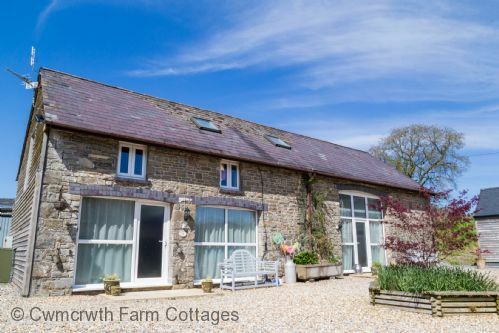 We had a really fantastic stay in the Hayloft in early March. There was lots to do on the fan from bottle feeding lambs, feeding goats and collecting eggs. Fiona and Rob have endless patience with the children allowing them to build confidence with the animals and be as involved as the children want to be. The accommodation was small but perfect for a young family. Floors all mopable which is great with muddy dogs and children. The spiral stair case is a bit tricky with little ones, but there is a stairgate at the top of the stairs which was fine for our two. The location is beautiful with beaches nearby and lots to explore. The house was clean and we had all the amenities. 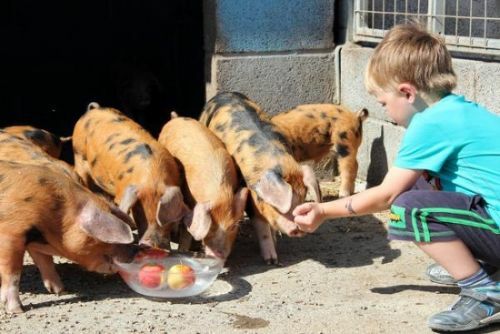 Our son had the wonderful time visiting the farm animals and helping to feed them. The owners are friendly and knowledgeable about the area. a lovely peaceful place to stay with lots of wonderful animals and great hospitality.we were welcomed with a piece of cake each which was a nice touch highly recommended. A lovely setting with the added bonus of animals nearby. Such good value for money and fab accomodation. Our hosts were so helpful and accomodating. Can't wait to come back. Many thanks. No football for the boys! - However, there are no balls allowed on the property, which was really boring for our boys - no football. - The trampolin and the playground with the wonderfull castle couldn't be used b/c of all the bird's dung. - Children had to be entertained and supervised all the time, not very relaxing for the parents. Thanks for sharing your views and we are sorry you did not find your stay relaxing. It is true we have had a problem with the crows this year but we solved the problem with a cover for the trampoline and sandpit which can be removed and replaced as required. Keeping it clean. Football is often played in the play area which is large and we can put a goal and dedicated area in place for more fun but as your son discovered it is not a good idea to play with stones and balls in the courtyard as sadly he broke a window. Mainly the children have been in the play area alone and the feedback has been brilliant. Thanks again for visiting.